“It’s good luck,” I said to my beau, as I saw the butterfly flying astern of us with his wings orange and black against the blue sky. Or were praying mantises the lucky creatures? Butterflies signified transformation? As we passed Thomas Point Shoal Lighthouse in 13 knots of breeze, gusts up to 18, and 75-degree temperatures, on the sunny side of the cockpit, after a satisfying ham-and-cheese wrap for lunch, that September Saturday buzzed with good fortune. That nature’s orange, fluttering work of art whispered a shift to autumn did not occur to me. Although, I noted other signs of seasonal shift. The black fleece vest with the Truckee Freestyle Ski Team logo I zipped up to my chin. The jeans I had dug out of the back of my closet the previous weekend, now rolled up to mid-calf, as if I were digging clams or walking on the beach—a small rebellious gesture that seemed to say, I’m not really wearing jeans yet. That’s so October. How later, after dropping the hook in a quiet anchorage, we scrambled to spice the chicken and grill it before the early sunset, when we both donned long-sleeved fleeces. And this, the most conspicuous autumnal harbinger: the skipper, who is always the first to strip and jump in the Bay, crinkled up his nose and admitted tentatively, as if it compromised his manhood, that it was too chilly for an after-dinner dip. Then, there were the stars. A few years ago, we had a late fall British Virgin Islands trip to plan for. This year, we will bundle up in our goose down jackets and enjoy the brisk fall days to come. We still have mini-getaways to plan. With the U.S. 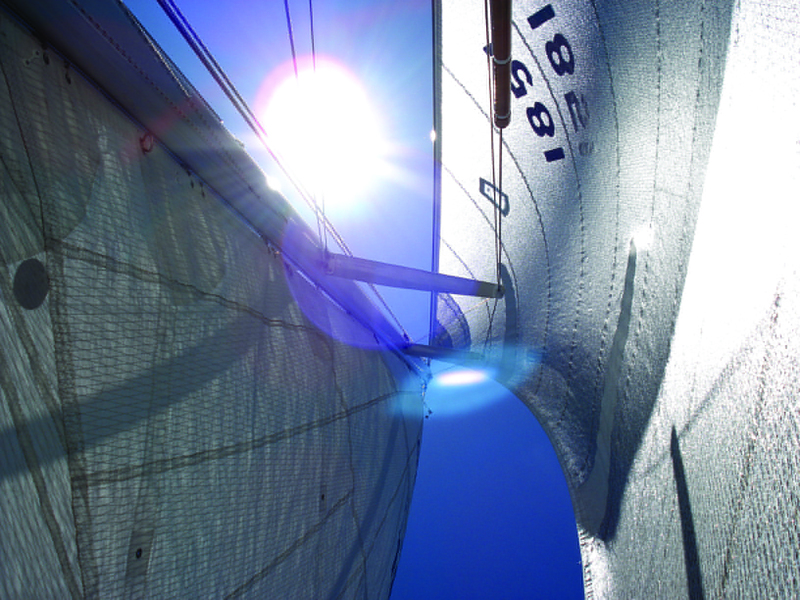 Sailboat Show coming over Columbus Day weekend, we can count on at least two available weekends left this season to comfortably overnight at anchor. In November, we will do something unusual for us, actually pay for a boat slip, and “plug in” at the Chesapeake Bay Maritime Museum docks. Dinner at a restaurant and heat on the boat: for us, that’s unusual luxury. For our final cruise four or so years ago, on a cloudy, windy day, we took a memorably quick sail from Annapolis, down around Bloody Point, up Eastern Bay, into the Miles River, and up the Wye River, where we slowly motored up Quarter Creek, until we were scared of running out of water. “You’re here already?” my friend asked when we called to say we were anchored in her creek. Not often, but sometimes, the wind blows just the way you want it to. I put the lasagna I had assembled the night before into the oven. A while later, my rain-jacket-clad friends, Kirsten, John, and their two sons, Jack and Ben, motored over in their Whaler through the drizzle and climbed aboard. You may have dear old friends who bring out the laughter in you; for me, that’s the Elstner family. If you are looking for a recipe for warming up a boat’s saloon in 50 degrees at anchor, baking lasagna and gathering six people who crack each other up are surefire ways to steam up the hatch windows. If our last cruise of this season ends as it did that year, we will indeed be lucky. I googled butterflies (and “butterflies and luck”), and based on what I learned, I believe the one I saw that day was a Monarch, known to start its migration in August and yes, thought to be a symbol of change. I also learned that the pioneer of chaos theory’s “butterfly effect” discussed the flap of a seagull’s wings affecting the course of weather; he later changed it to butterfly to give it a poetic ring. 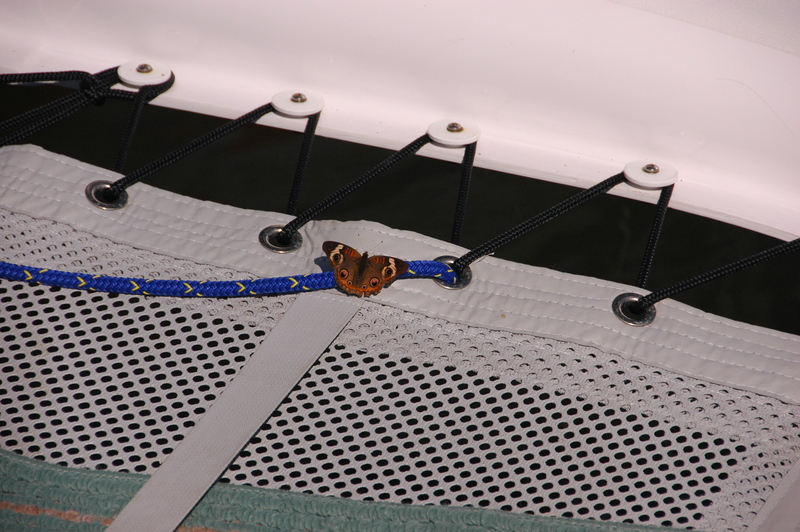 Our Monarch friend sailed alongside us for quite a while, his wings apparently well-equipped for a fresh breeze. Perhaps, he will hang out along the West River until the first frost. Then, the circadian clock in his antennae, his inner compass, and some say, the earth’s magnetic field will guide him south, maybe to Key West, maybe to México. Mother Nature loves an escape plan. A version of this article first appeared in the October 2012 SpinSheet. Winans is the editor of SpinSheet and PropTalk as well as an avid sailor.